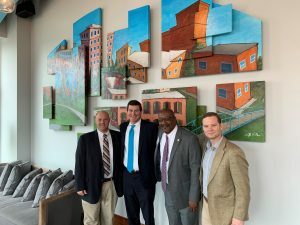 Local EDC staff, Bo Carson, Harry Mills and Stacy Woodhouse traveled with Ryan Combs of Research Triangle Regional Partnership (RTRP) on an economic development marketing trip to promote Triangle North sites. 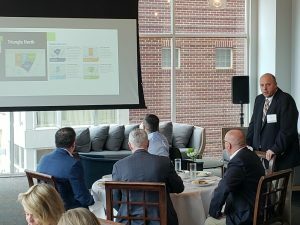 They visited Charlotte, NC and Columbia/Greenville, SC and had the opportunity to address over 30 site selection consultants and real estate brokers. New Officers were installed to the Triangle North Board in 2017. Danny Wright (Vice -President), David Smith (Chairman and President), Dan Brummitt (Vice Chairman), Walter Powell (Treasurer) and Sidney Dunston (Secretary). Officers of the Board of Directors work on the Triangle North project. 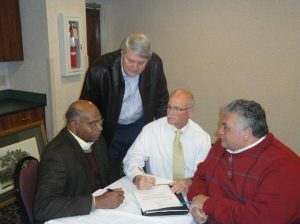 From left to right: Terry Garrison, David Smith, Don Lancaster and Barry Richardson. Triangle North offers 4 unique business parks that are in the Research Triangle Region of North Carolina. These parks are located in Franklin, Granville, Vance and Warren Counties. This corporation has been developed between the four counties with a very detailed Inter-local Agreement and is administered by the Kerr-Tar Regional Council of Governments. Triangle North Franklin – Is a 252-acre business park that is adjacent to the Triangle North Executive Airport and has a 33,900 square foot shell building that is ready for tenants and an additional 100,000 square foot facility that is for sale or lease. Triangle North Granville – Is a 527 acre business park that has frontage along Interstate I-85 and would be easily accessed from I-85. It is also in close proximity to the Henderson-Oxford airport. Triangle North Vance – Is a 422 acre business park that is adjacent to I-85 and across from Vance Granville Community College. The Community College would work with incoming industry to train the workforce they would need. Triangle North Warren – Is an 860 acre park that is also off I-85 and US1/158. Its location would make it a perfect location for a large manufacturing or distribution site. It is also in close proximity to the rail transport.